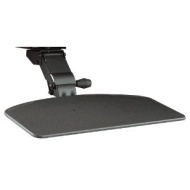 alaTest has collected and analyzed 13 reviews of Bush Universal Articulating Keyboard Shelf. The average rating for this product is 3.3/5, compared to an average rating of 4.1/5 for other products in the same category for all reviews. Reviewers really like the design. The usability also gets good comments. Some have doubts about the reliability and price. We analyzed user and expert ratings, product age and more factors. Compared to other products in the same category the Bush Universal Articulating Keyboard Shelf is awarded an overall alaScore™ of 81/100 = Very good quality. alaTest has collected and analyzed 7 user reviews of Bush Universal Articulating Keyboard Shelf from Amazon.com. The average user rating for this product is 4.1/5, compared to an average user rating of 4.0/5 for other products in the same category on Amazon.com. Reviewers are impressed by the durability. The usability also gets good feedback. Many are critical about the reliability and price. Works as described, good unit for the price. I was disappointed in this product. Once installed it did not stay where I set it, and it continually fell into my lap. I felt like when I put any pressure at all on my keyboard it was going to break. Uninstalled it and returned it. Keyboard falls off this keyboard tray. Nothing to hold the keyboard on the tray.